A home energy assessment, also known as a home energy audit, is the first step to assess how much energy your home consumes and to evaluate what measures you can take to make your home more energy efficient. A Home Performance Energy Audit performed by a Building Performance Institute (BPI) certified auditor will assess your home’s energy consumption, pinpoint where energy is being lost, and evaluate and recommend measures to take to improve your home’s energy efficiency. 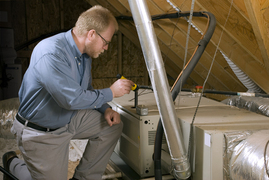 For a limited time the EmPower Maryland Program is offering a $300 rebate on whole home energy audits. You receive a complete evaluation of your home's energy efficiency, and a thorough review of the audit and any recommendations with an energy coach -- a $400 value for only $100. "When considering the relative low cost of the audit, i.e. $100 dollars for $400 audit, it's a great deal. Throw in the potential cost savings that could be realized by some of the recommendations make it's a no brainer." Dennis B. These audits make you eligible for up to $7,500 in rebates, through EmPOWER Maryland’s Performance Based Incentive program, to make your home more comfortable and energy efficient. This offer is for a limited time so act now. Our auditors use the latest techniques and equipment including blower doors which measure the extent of leaks in the home’s building envelope, and infrared cameras which reveal hard-to-detect areas of air infiltration and missing insulation. We’ll help you prioritize repairs and improvements so you can solve the biggest problems without making smaller problems worse. Contact A.J. Michaels for additional information or to schedule your audit today.